Very satisfying. Their pizza crusts are excellent: chewy and aromatic. 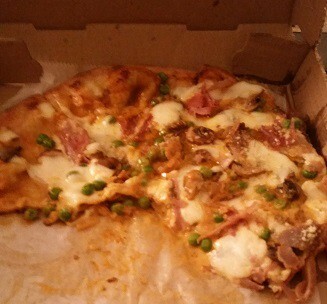 The prosciutto could stand out more… I can’t help but feel it would have been the same pie without it. Not that it stopped me from enjoying this entirely, and by “enjoy this entirely” I mean I ate the whole pie, inhaled it. Tasty vodka sauce… I think there was a little thyme in it, or maybe oregano, herbs that I like with peas. The local Greek place is a favorite. I always get their pork souvlaki wraps when we order in from them on Thursday nights, which is frequently. They’re delicious, satisfying, craveable wonders, stuffed with French fries. I hadn’t tried their pizza til now. Tonight we got a large “house special” (ground beef, pepperoni, sausage, green peppers, mushrooms, and onions) and it came with a free, small cheese pizza. Filo’s compares favorably with my other favorite pizza in town, made by the Hungry Ghost. 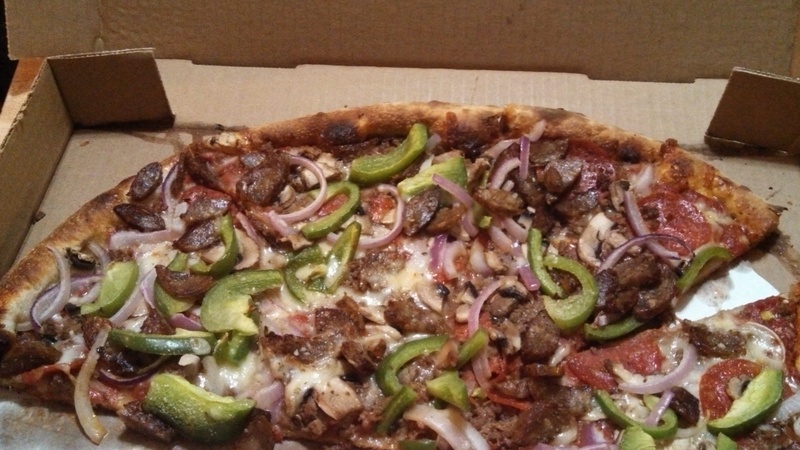 If the bread part of the pizza isn’t good, I don’t care what you put on it. Both of these are good pies. But Filo’s delivers.